The draped dress continues! 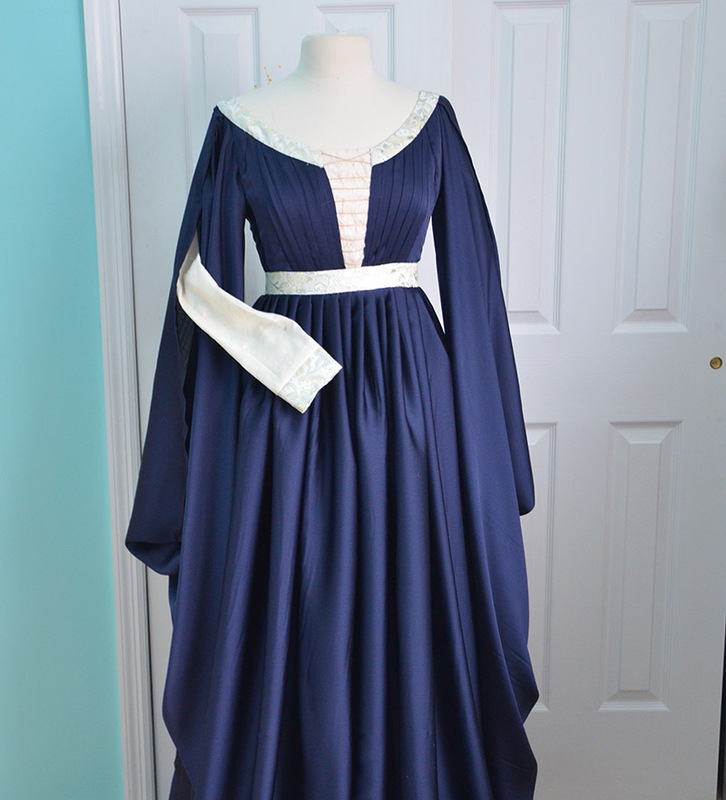 Part One is posted here, it talks about making the lining for the dress, and though that was successful, it wasn’t looking very pretty. 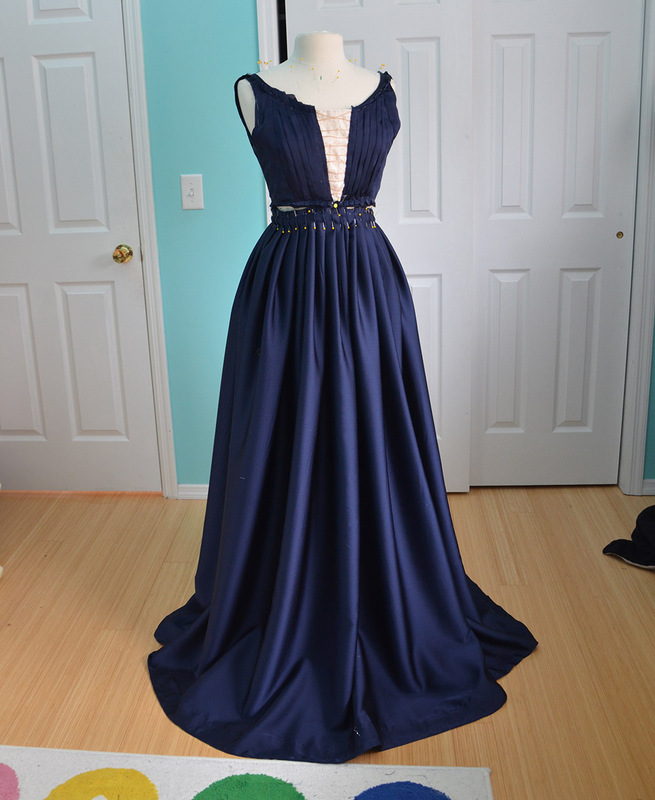 Today i’ll be adding the satin faced chiffon and making it look much better! So this is the mess I left off with. 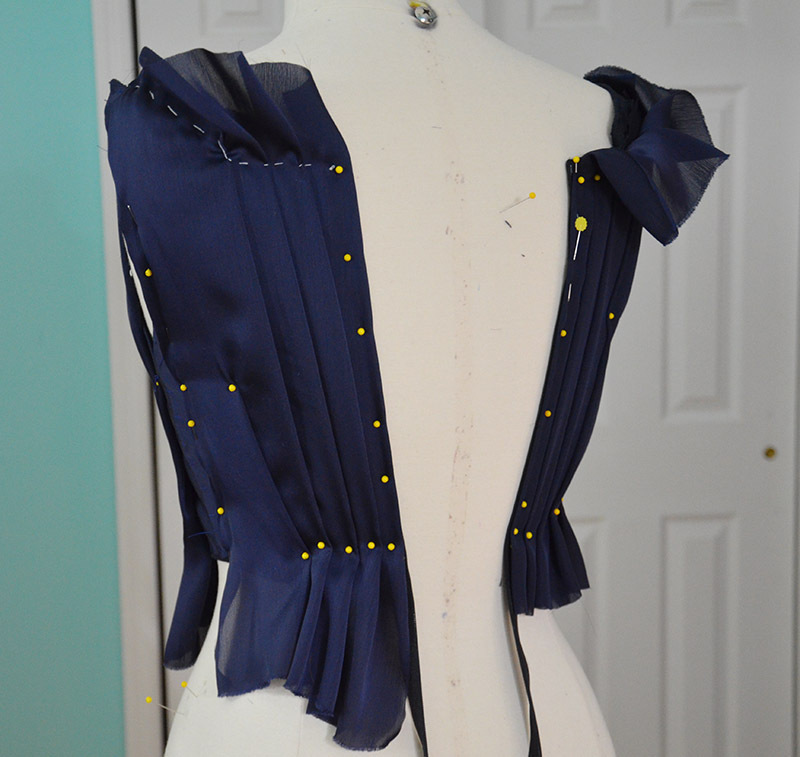 The first step towards improving it was creating side panels from chiffon. 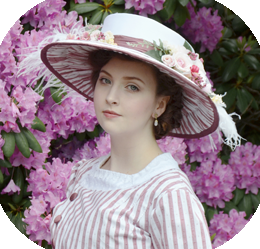 But the chiffon is too delicate to keep the shape these panels require. So I backed them with a medium weight fusible interfacing. 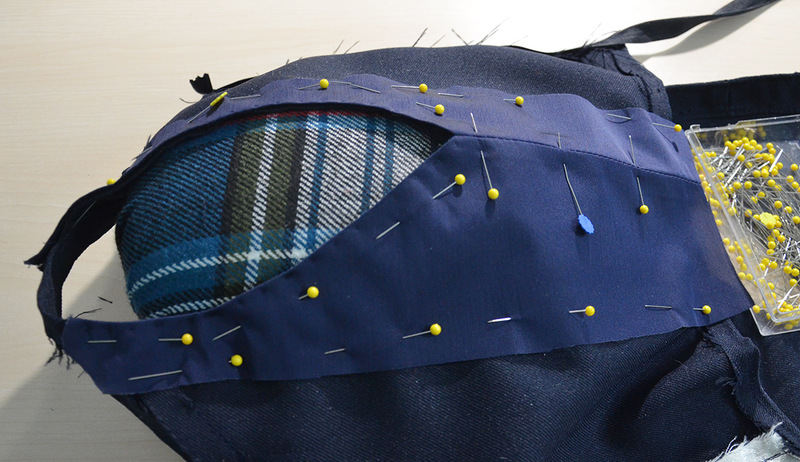 The edges got turned under, then the side seams were sewn. 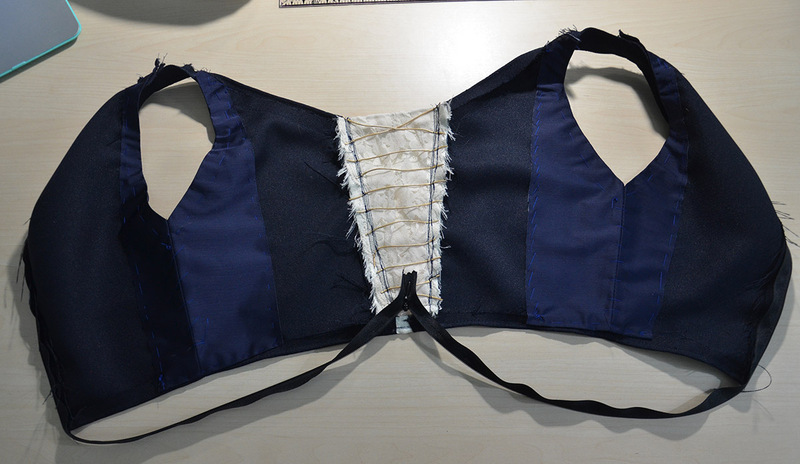 I removed the bodice lining from the dress form and pinned the side panels over it. 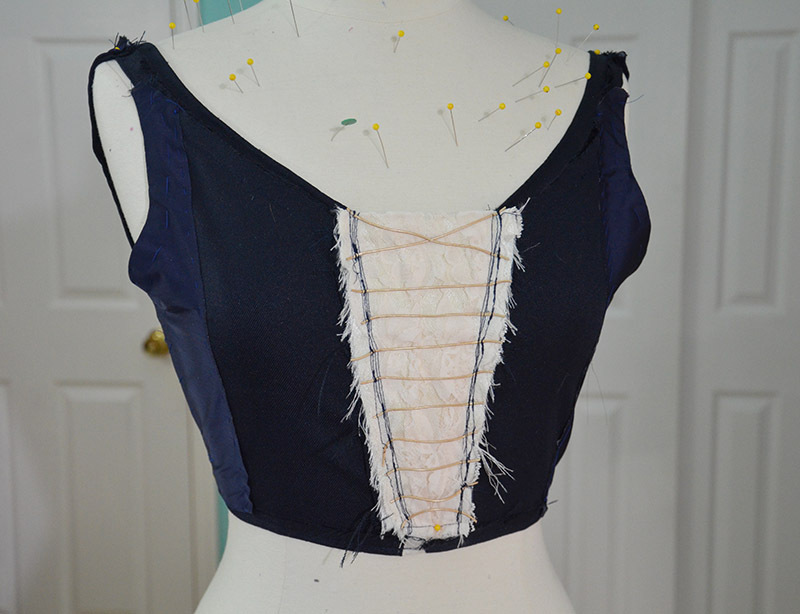 I rested the bodice over an ironing ham to make sure the shape was right! Then the side pieces were sewn on with big basting stitches, these will get removed later on so the sleeves can be attached. Here is what it looks like on the form! 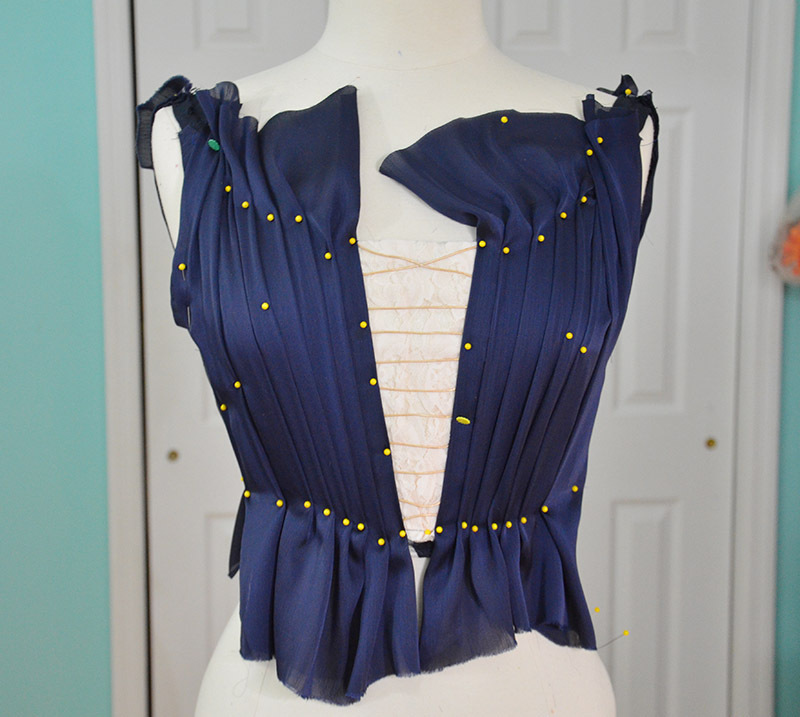 Once it was pinned in place I could begin draping the chiffon overtop. I had this weird assumption that this part would be easy. I was wrong. 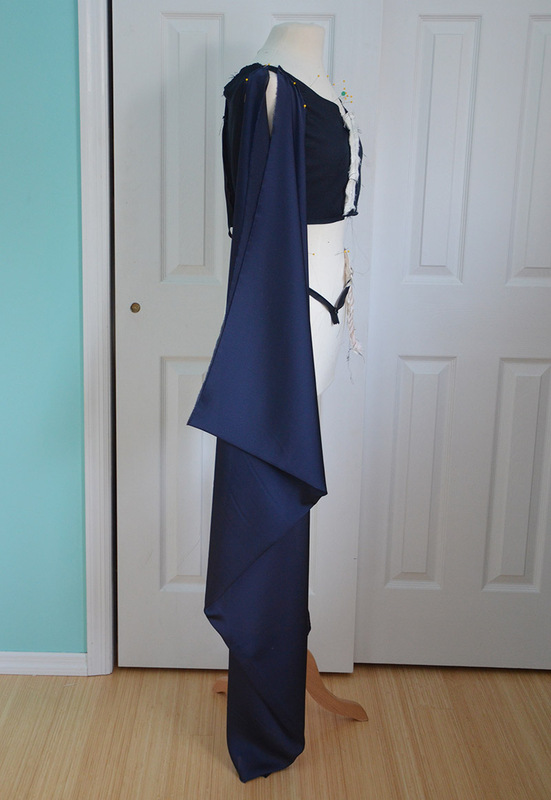 Granted my only experience with draping comes from watching Rami Kashou and Austin Scarlett do it on project runway, which apparently isn’t enough of an education to make my attempts turn out brilliantly on the first try. After two – or maybe three, it all blended together in a big mess of frustration, hours I had something that looked decent! And kind of symmetrical. Not really symmetrical, but it was close(ish). 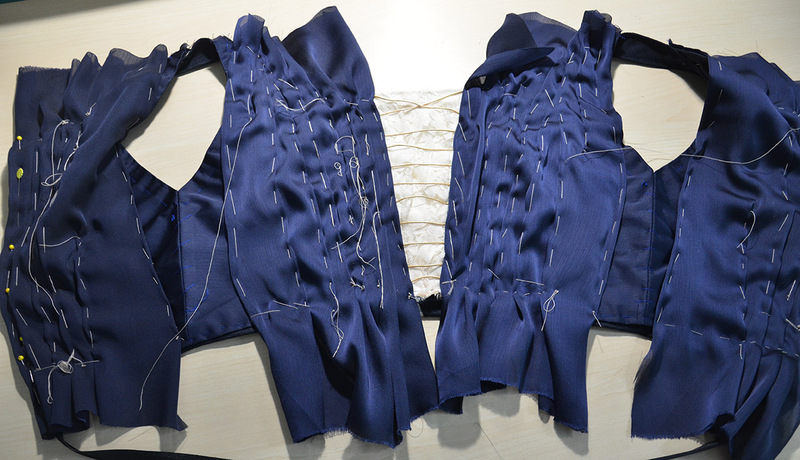 I used large basting stitches and white thread to secure down all the pleats. 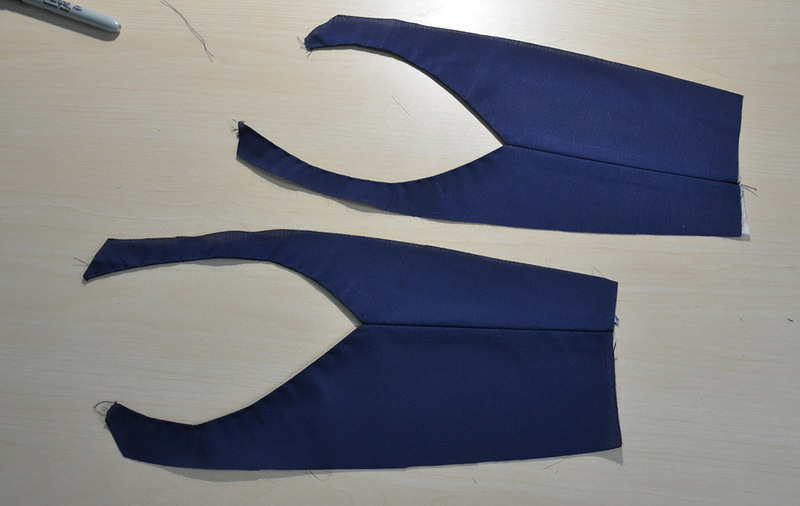 My first plan was to sew them down by hand, which I did on the left side. After trying it on I realized it looked TERRIBLE. Even the tiniest stitches created a lot of puckers and it lost the effortless look I was going for. So that got ripped out. You may notice the back left side looks a little weird. Because I was doing this in a dim room and didn’t realize I was working on the wrong side of the fabric, so that had to be ripped off and re draped. The back up plan of keeping everything when it should be involved ironing the crap out of it and hoping the pleats would stay in place, which totally worked! 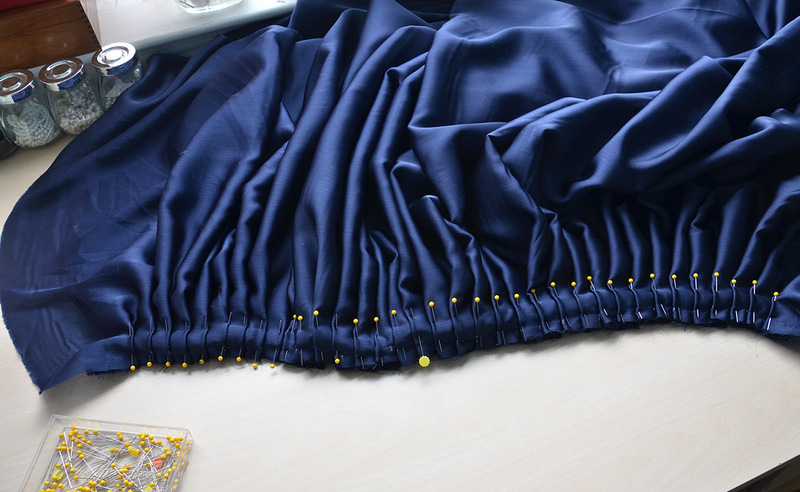 Now it was time to move onto the skirt! I cut out another large rectangle, but I made it a couple inches longer than the gabardine layer I cut for lining. 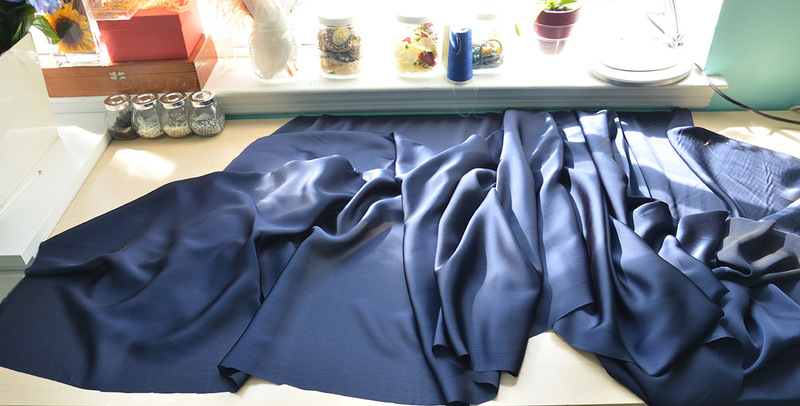 I wanted to make sure the gabardine wasn’t visible at the hem, and since I wanted the skirt to drag it made a lot of sense to leave it extra long. After cutting the skirt to the proper length I had a three inch wide strip leftover. I folded that strip in half and ironed it so there was a sharp fold. Then I stitched the side with two raw edges onto the raw edge of the skirt. I treated it like you would any hem tape and turned it inward to the wrong side of the fabric, so the raw edge was hidden. I pinned this in place and then spent a few hours hemming the damn thing, doing my absolute best to avoid puckers. When that was finished I stitched the top of the skirt to the gabardine layer. 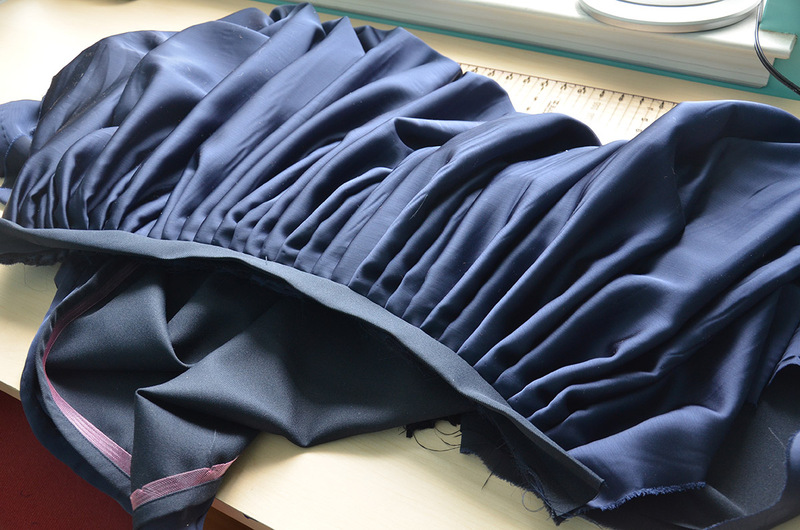 Then I pleated the top into three quarter inch wide pleats. Two thirds of them face one direction, and one third faces the other. 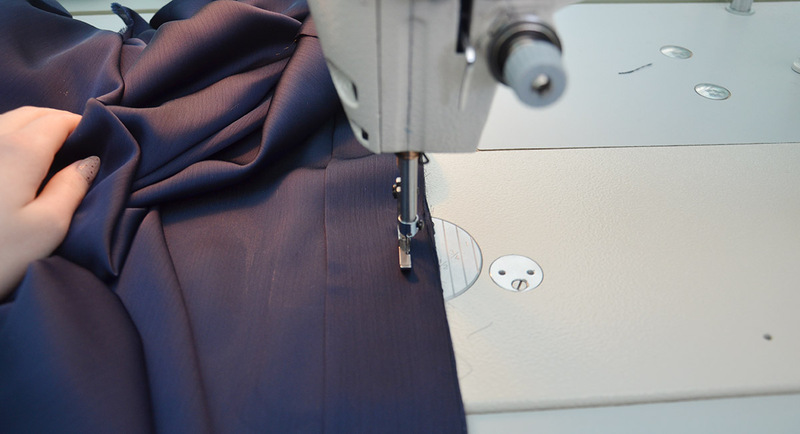 I attached a gabardine waistband to the skirt and turned the raw edge under so there was no added bulk at the waist. Then the raw edge was finished with home made bias tape to prevent fraying. With all that pinned to the dress form I had something resembling a dress! Now it was time for sleeves! The original plan was to have an undershirt made from brocade with fitted sleeves. I made the undershirt but I eventually realized the print was a little busier than I wanted, and I wasn’t happy with how it looked under my dress. 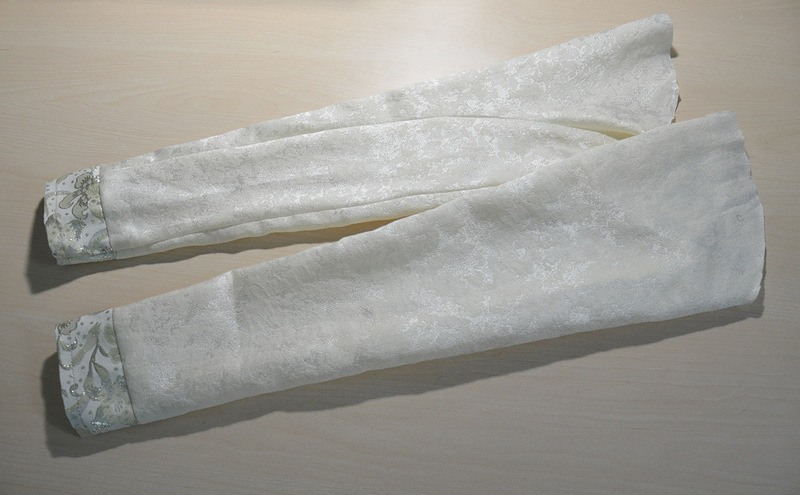 So I scrapped it, and decided to make sleeves from ivory jacquard. Coming up with a pattern was a huge pain because the bodice has pointed arm holes, which are really difficult to set a sleeve into. The end result aren’t very pretty on the upper arm, but they are functional enough. I didn’t take any pictures of the process, but here they are! Overtop of those sleeves I wanted draped sleeves that were open at the tops and nearly hit the floor. I was expecting this pattern to be quite complicated, but after cutting my remaining chiffon into two panels (40″ x 60″) and playing around I realized I could create a really pretty sleeve without cutting them at all! This is just a rectangle pinned around the arm hole, and it falls really nicely. So I went with that! After making sure both rectangles were the same size I used a crayon to mark guidelines on the raw edges. The raw edges got turned inward by a half inch, twice, to prevent fraying. I stitched them down, which was time consuming since this fabric is so delicate. But the end result was really lovely. In this photo they are just pinned, but they got stitched on properly soon after. 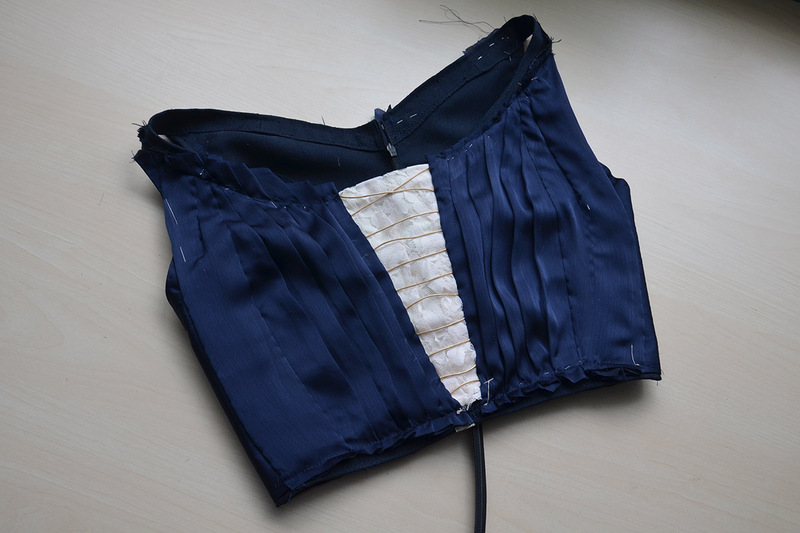 Both sleeves were sewn onto the lining, then the side panels of the bodice – which were previously basted in place, were stitched around the sleeves to hide any raw edges. 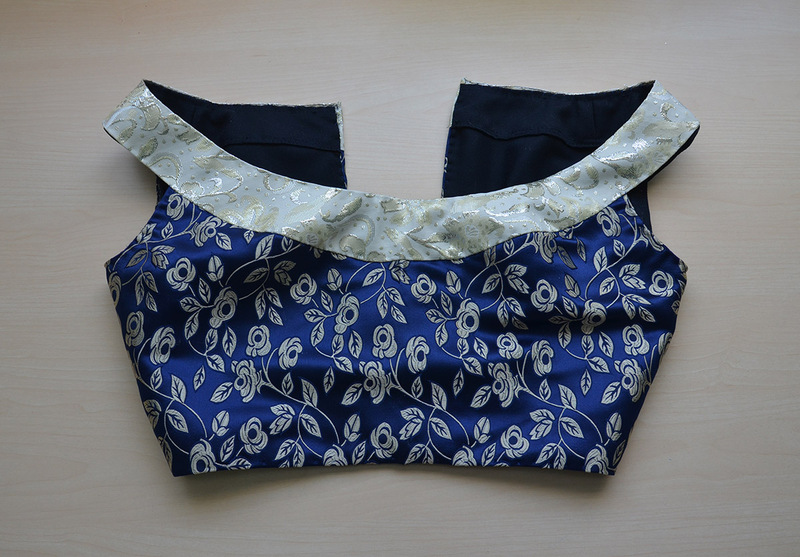 The skirt got sewn onto the bodice, then I made a waistband to cover the raw edges. 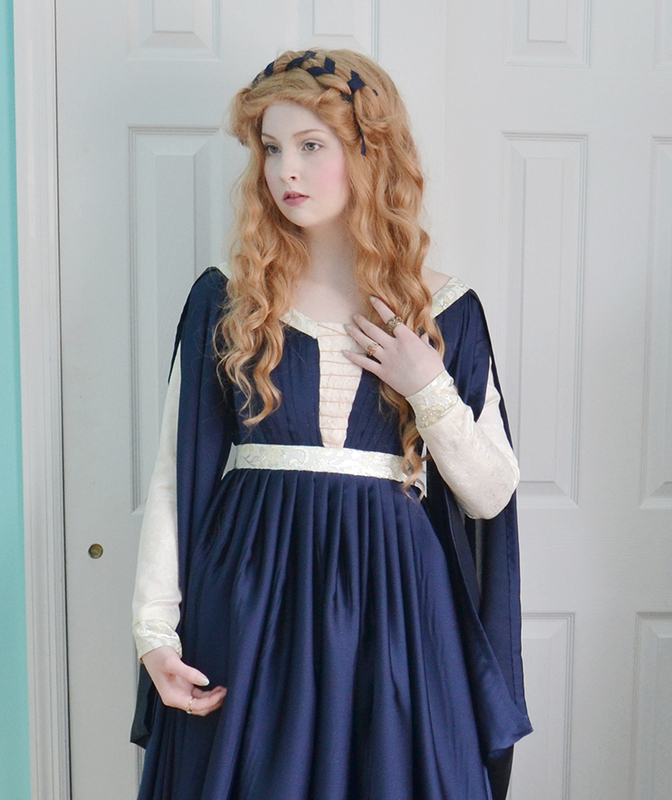 I wish I had enough chiffon leftover to make a blue sash, but the only remaining fabric was a 1/2″ wide strip of salvage. So Instead I used a piece of brocade. Brocade also got sewn on to create a collar. 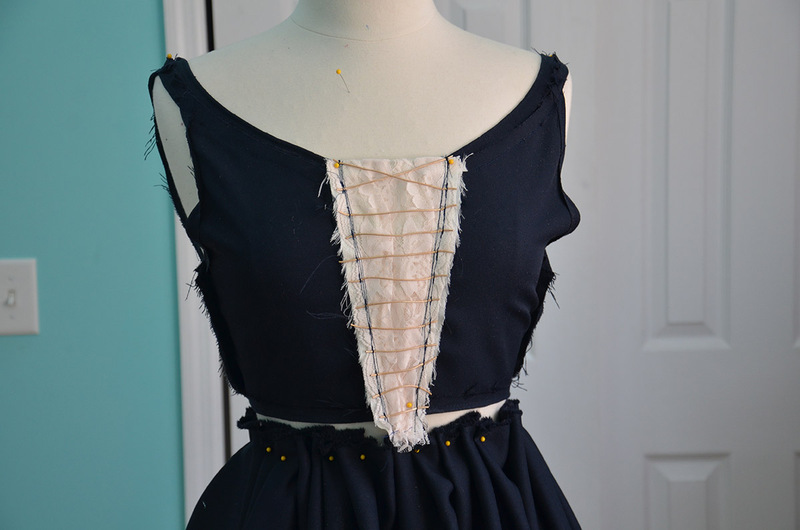 Lastly I stitched eyelets into the back of the dress, I had originally stitched a zipper into the back but it wouldn’t zip smoothly past the bulk the pleated skirt created. But that’s okay, I like eyelets! 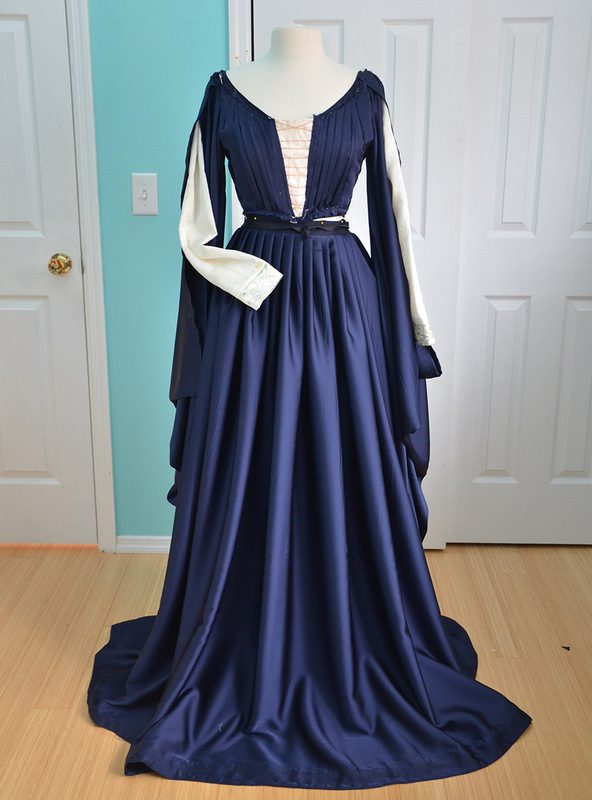 With that finished, the dress was done. Here are some worn pictures! I used the salvage strip of leftover fabric in the wig because I didn’t have a matching headpiece. 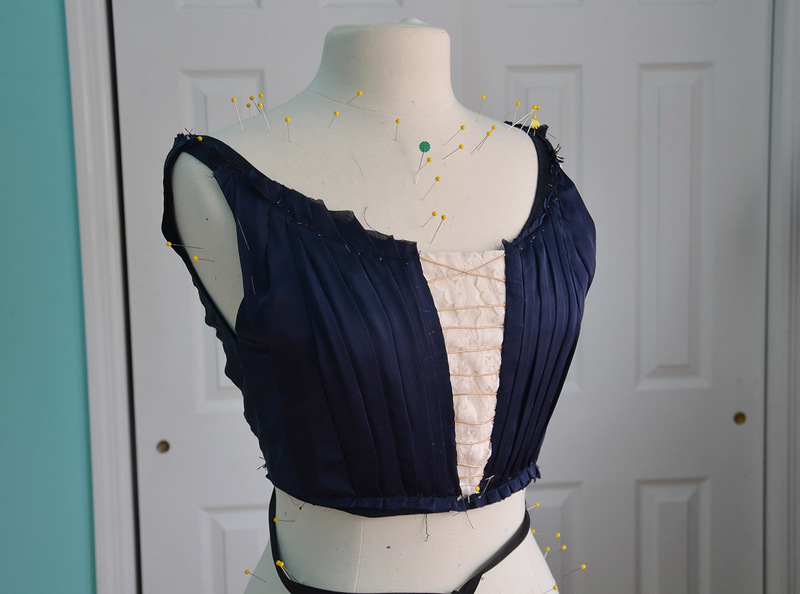 I think in the future I would like to add some boning to the centerfront and sides, which should keep the front smoother and allow me to lace it tighter at the back. Right now it isn’t very flattering. But before making any changes i’ll try it on with my pair of bodies or stays, which should give a similar result. So that’s it! Not bad for something I made in four days from things in my stash. Your dresses are so unique! I love seeing them! It turned out very elegant. I love this! The colors and drape are gorgeous. I think you did a great job draping it. I especially like the over sleeves. Everything you do is perfection! 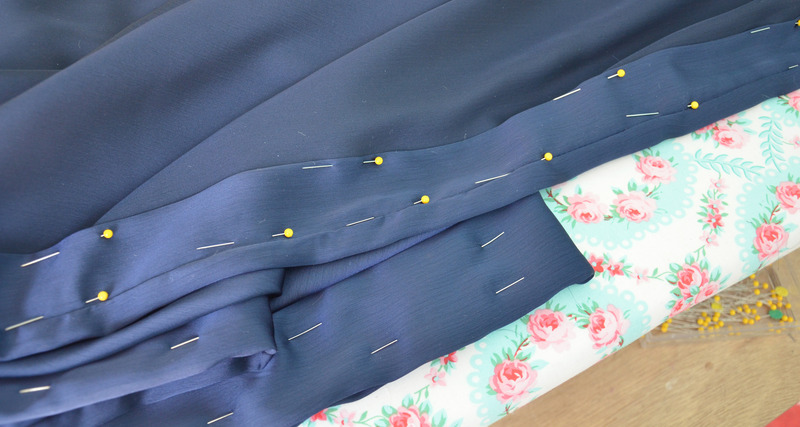 Out of curiosity, do you make bias tape actually on the bias (or just use long strips of straight/cross grain)? I am trying to figure out whether it’s actually worth the effort to cut on the bias, since it is usually so much more wasteful. Thank you! 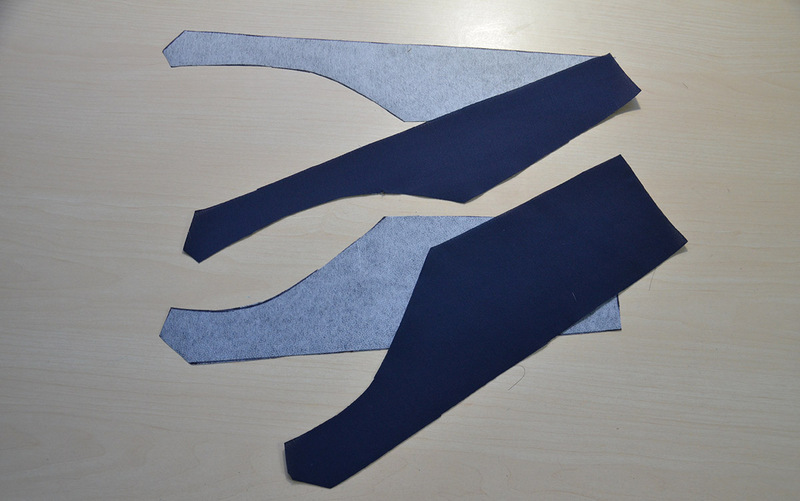 For straight seams you can bind them with straight grain “bias” tape. But I try to cut on the bias whenever possible. Without that, it’ll pucker. 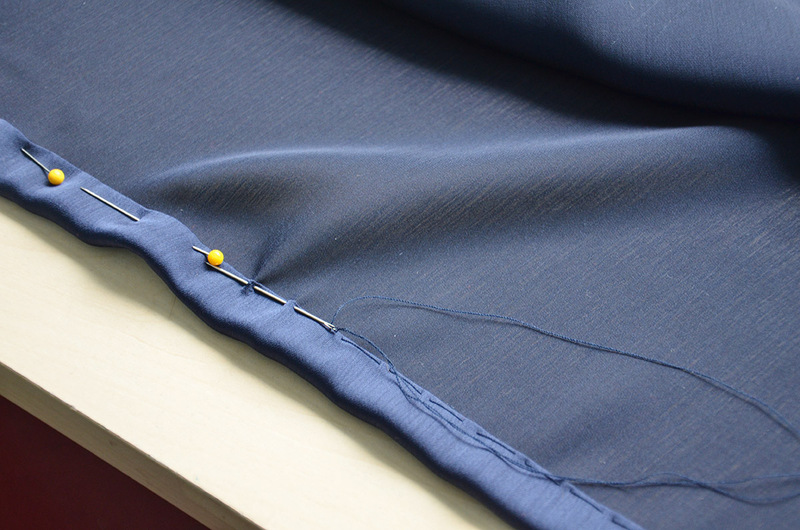 Plus bias cut fabric frays less, which makes it much easier to fold into thin strips! Gorgeous!!! You do look like a Saint in this dress! I love it! Fantastic job! The sleeves really came out great! 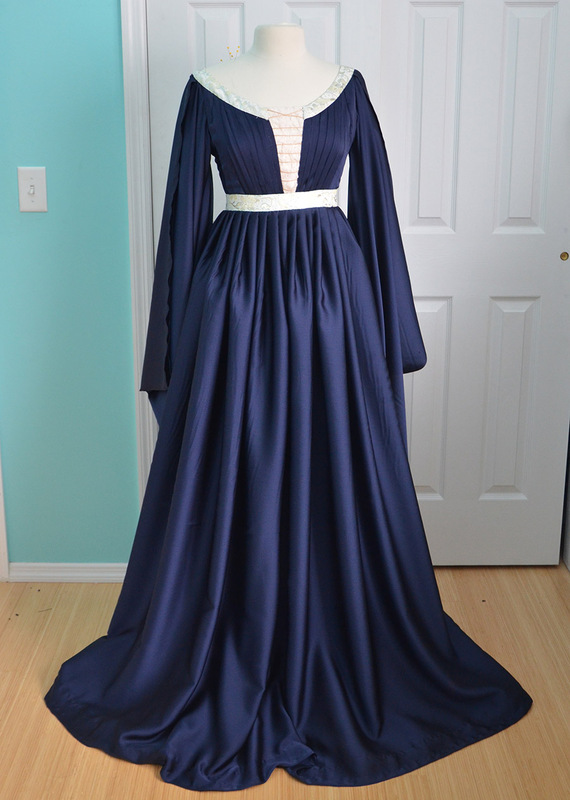 Such a great looking gown, I love your sleeve solution. 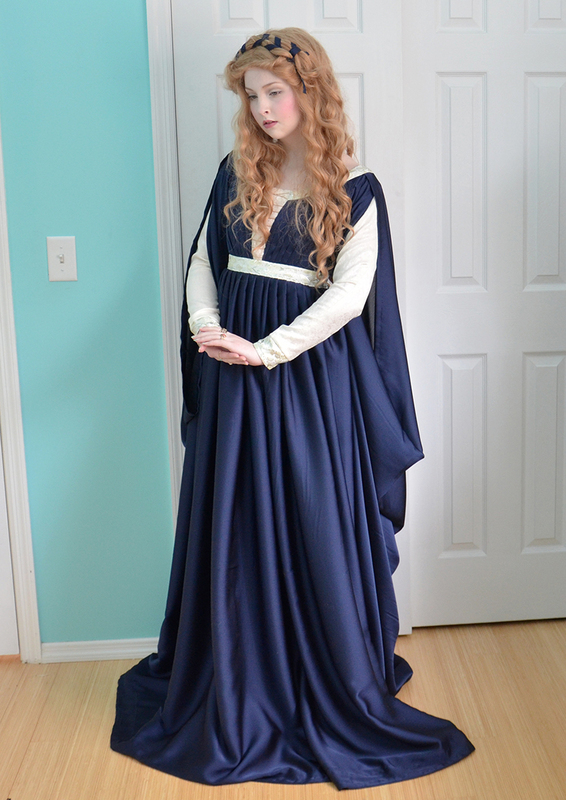 You look so much like Lucrezia Borgia from The Borgias here! You sew with a sewing machine or by hand?